From hosting rockstars to being viewed as one by patrons, hotel managers hold the keys to a never-boring, always fulfilling career. With over an estimated 17.5 million hotel rooms within somewhere between 205,000-500,000 hotels, not including motels, bed and breakfasts, and other forms of hospitality establishments, there’s a lot of room for hotel managers. 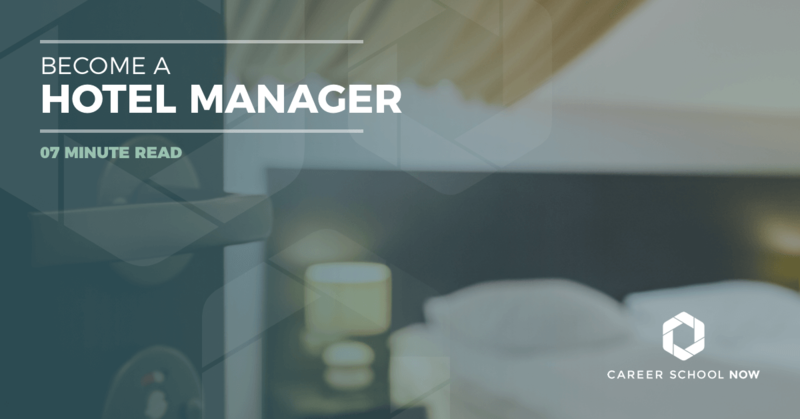 For all aspects of hotel operations to run smoothly for both staff and guests, a hotel manager (or sometimes, more than one manager) is employed. That means there are a lot of positions all over the world just waiting for your expertise! Managing a hotel can be an exciting and rewarding career. Learn more about hotel management and how to climb that career ladder. For as long as humans have been traveling, there have been places for them to rest and refuel. Inns throughout the United States started popping up in the 1700’s when pioneers were making their way across the country. In Europe, however, monasteries had been doing similar hospitality related services since the Middle Ages. Back then, only the basics of food and bed were provided on both continents. As competition grew, so did the amenities offered in these establishments. By the late 1700’s, hotels were being built to provide a place of rest to a larger quantity of guests. In the 1920’s, corporations started taking over these mom and pop hotels, and the first hotel chains began to grow. By the time hotels evolved into something similar to what we have today, hotel management training courses were recommended, providing only the essentials of education to interested students. A Hotel Manager, also referred to as Lodging Manager or Hospitality Manager, is the backbone of the hotel’s inner-workings and operations. Whether it’s bed and breakfast or a corporate hotel chain, hotel managers are employed to oversee everything from staff to guests, and all the details surrounding them. A hotel manager that is hireable with absolutely no reservations is one that will make the hotel highly profitable. Smaller hotels don’t usually have as stringent hiring policies as larger hotel conglomerates. Diploma/certificates or associate’s degrees are typically all the hiring personnel look for in their hotel managers. While hotel managers might not makes as much salary as some other management positions, there are other benefits that are bountiful to make up for it. Some hotel chains offer bonuses that could be equivalent to 30% of your salary. Nothing to turn up your nose at! Friends and family (and you) get discounted rates at hotels within your chain. Anywhere in the world they have properties. Ok, vacay away! There’s something to be said for wearing a uniform. You don’t have to spend a fortune on work clothes, and you don’t need to plan out what you’re going to wear. That, my friends, is a huge perk. With a degree in hotel management, the whole world is your (work) oyster. Some hotels also offer car and gas allowance, gym memberships, free food, insurance, and so much more. To be an asset to the hotel industry and prove you’ll be a great return on their investment, you’ll need to have certain skills. Not only will these skills be necessary to wow employers, but they'll also be invaluable when you’re hired and on the job dealing with guests and staff. Critical Thinking: Hotel managers need to be MacGyver...a skilled troubleshooter. There’s a problem; you have the creative and practical thinking skills to solve it, leaving everyone happy and wondering how you did that. Don’t worry, your secret's safe. A panorama of people personalities will walk through the door. Some more pleasant than others. And, you know how to deal with that whole spectrum because basically, it’s your superpower. Organizational Skills: If your knee-jerk reaction is to color code and alphabetize, then you’ll fit right in as a hotel manager. Because the position comes with so many responsibilities, you will need to keep it all cataloged, documented, and coded. Communication Skills: Communicating clearly across a variety of mediums such as letter writing, speaking with hotel guests, staff, and executive, is imperative to the position. As a hotel manager, you’ll have to put together and present summaries that are easily understandable in both the written and spoken language. You’ll also have to know how to talk to people because, hey, you’re in an industry teeming with humans. Computer Skills: Computer systems and software are part of the job. Hotel managers must have computer savvy skills to work in today’s market. Everything is done via a computer, from creating a work schedule to billing and payroll, and beyond. If you don’t understand how to use computers, you’ll find it hard to compete in the job market. Financial Skills: Hotel managers are in charge of the budget, setting room rates and specials, and mainly just keeping track of all the money coming in and out of the finances. So, for that reason, hotel managers must have skills when it comes to financing. Yes, this skill can be learned. To work in a large hotel chain, you’ll most likely need a bachelor’s degree in hospitality or hotel management. Smaller hotels don’t require as much education, and diplomas or associate’s degrees in hospitality work just fine. Many hotel managers get their start simply by graduating high school and working their way up the hotel management's chain of command. Some high schools across the country offer a two-year Lodging Management Programs of the American Hotel and Lodging Educational Institute Lodging Management Programs of the American Hotel and Lodging Educational Institute that, if you knew in high school this was an area of interest, you could enroll in the program. Some programs offer internships. These paid training opportunities are important because, to get hired on as a hotel manager, you’ll need to have related experience listed on your resume. Hotel chains like Marriott, Hyatt, and Starwood offer internships. Certifications for Hotel Managers are strictly voluntary. However, it does look pretty snazzy on your resume, and it could give you a little lift above any competition you may encounter. The Certified Hotel Administrator(CHA) certificate offered by the American Hotel and Lodging Educational Institute is a fancy one that’s highly recognized around the world, and while you don’t have to do it, it’s recommended. Members of the AHLEI pay $525 to take the exam, and non-members are charged $700. The AHLEI offers other certifications within the lodging industry for professionals in the food and beverage, education side, hotel suppliers, and revenue management and sales. Many variables are going into college costs, such as whether you’re going to a school in-state, or out-of-state, getting an associate’s or bachelor’s, and if it’s a private or public college or university. All these factors weigh heavily into the cost of education. An associate’s degree is usually a more cost-effective route, but the degree doesn’t necessarily come with as many open doors as a bachelor’s degree in the same field does. Associate’s degrees in hospitality management run, on average, around $3,100 annually. A private four-year university could potentially run over $30,000 per year, putting a $120,000 price tag on that degree. A bachelor’s degree from a public college, for an in-state student, is less costly at an average of $9,000 per year. These costs are tuition and fees only; there are additional fees for room, food, and other such incidentals. Scholarships can help bring down the cost of school. There are a few out there that are unique to hospitality degrees such as the American Hotel and Lodging Educational Foundation Scholarship, The Hospitality Industry Network Scholarships, American Bus Association, and the IFAEF. Find out more information about financial aid here. The Bureau of Labor Statistics reports the median annual salary for hospitality management to be just under $52K annually. The lowest 10% made over $28,000 per year, and the top 10% earned a tad bit over $96K. Hotel managers work full time, and sometimes have to be on call 24-hours per day because hotels never close. The employment of hotel managers will see average growth through 2026. This means hotel management careers will grow as fast as most other occupations. However, with the economy seemingly regulating, more people will enjoy travel which will contribute to the need for hotel managers.